This chapter was interesting because of its typological juxtaposition of Christ with Solomon. I strongly doubt that anyone sees no resemblance between the two. But the similarities that Dr Leithart brings out are fascinating. 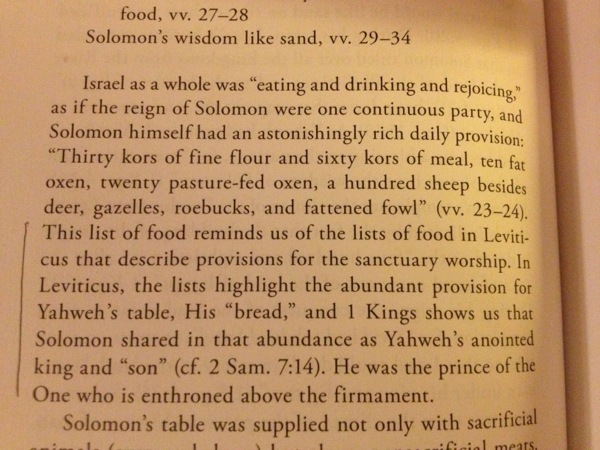 Primarily, Solomon's table is always in feast. Because of the work of his father David (whom Jesus also typifies), Solomon enjoys peace and constant feasting. For the church we celebrate under the new and greater Solomon. For us this Solomon is also the greater David....great thing that typology. But was truly fascinating is the relevance of Solomon opening His table to Gentiles. Read in the context of the Old Testament this is a gapping change in the procedures of Israel. Not only has peace been achieved but the missional elements of Israel are experienced briefly. Now Solomon does in fact fail but be works as a type of Christ. Christ conquers, reigns in peace and invites the Gentiles to His table. This time however Christ's reign will not be perverted (though His church may be). This time Christ will not fail to ask of God the kingdoms for His inheritance. And all of this is testified to by our participation in the King's feast.